I have a confession: things generally scare me more if they're in black-and-white. Black-and-white can hide so much clarity, which makes things quite vague, which in turn makes things terrifying. Add in some jerky camera movements and the old-school techniques from the 1920s, and my paranoia scale is sure to go up a few levels. The Cabinet of Dr. Caligari is a pioneering movie: it is said to have introduced the "twist ending" to cinema, it uses a unique expressionist style, the sets are abstract paintings set onto canvases. 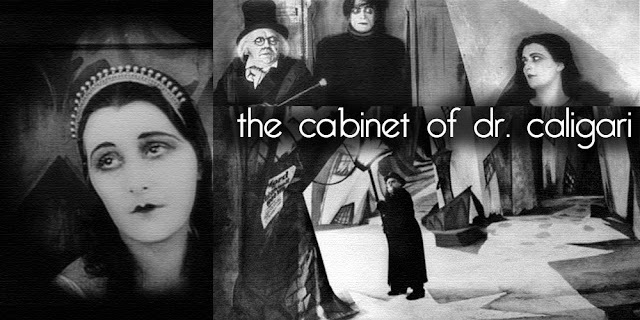 Even though it was made 98 years ago, The Cabinet of Dr. Caligari scares with its unforgiving atmosphere. The sets may not display the most detail or go into many dimensions, but the sheer obviousness of it gives the film a surreal edge, fitting with the major themes of the movie. The film is based around Dr. Caligari (Werner Krauss), who keeps a near-silent sleep-walker, Cesare (Conrad Veidt) in a cabinet, and uses him as a sideshow attraction. Just like Nosferatu two years later, Cesare was brought to terrifying life (or lack of life, as it were) by make-up trickery that doesn't seem to work as well these days. Cesare, with his dark eyes, dark hair and jerky movements, is one of the scariest figures I've seen on film. 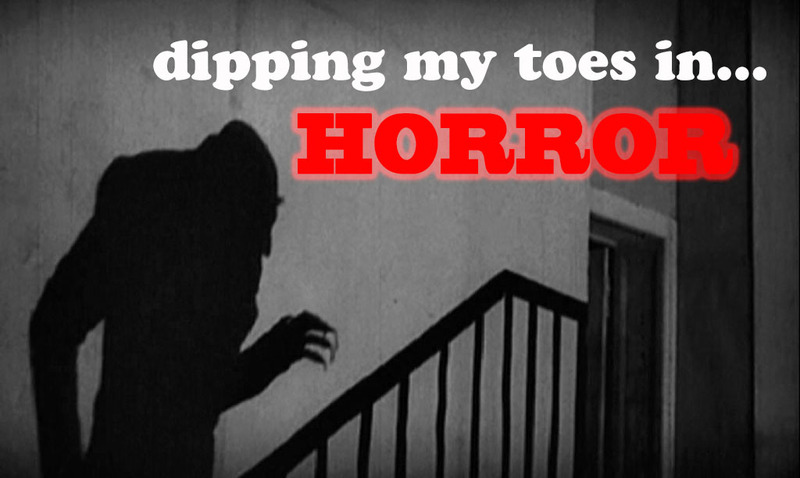 Almost as scary as dear old Nosferatu. No-one could make a scary figure like these guys did back in those days. Because these days, we're all about the 'scary' figures that you can't see (I'm looking at you, Paranormal Activity). From watching the film, I can see just how much of an influence it had on future horrors/psychological thrillers. The twist is something I've seen done so many times now, but somehow, it never seems to lose its surprise (well not for me, anyway, but I'm a little stupid). Here, it took me completely by surprise, mainly because half of the time I wasn't completely aware of what was going on. I can see why people latched onto it, and continue to latch onto it today. The film is just brilliant - how could you not be influenced by it? Another influential horror flick from 34 years ago is Halloween, which, incidentally, is a popular choice to watch on the titular holiday. Along with witches, another thing from my childhood experiences with movies that scares the crap out of me are jack-o-lanterns. I can't remember what the movie is, but I do remember a scene where the jack-o-lanterns get angry as and tie everyone at this party up (sounds pretty unreal...I'm not actually sure if this is a movie or not, haha). Seriously, I couldn't even go to the toilet afterwards. And it was the middle of the day. And usually, we're not in the habit of having jack-o-lanterns. So when this movie started with a jack-o-lantern accompanying the credits on a black background, the five year old inside of me was crapping her pants. Luckily, there were no evil jack-o-lanterns in the rest of the film. The film itself wasn't as scary or as gory as I thought it would be, but its simplicity is quite effective for the most part. Again, this is a movie that works on atmosphere, from the pulpy look of the low-budget late 70s to the heavy breathing from Michael Myers. The suspense is what drives this movie, not the gore - which is something that many of the films that have been 'influenced' by its slasher story get mixed up. It was nice to see such suspense going on, but sometimes I felt as if barely anything was going on. I wanted a little more out of my experience...but then again, I was trying to get as little as possible out of it because I was at home alone and it was a school night. And because I was scared that a jack-o-lantern would tie me up. Oh, and Jamie Lee Curtis is awesome. What do you think of these films? Are you a silent horror fan? Or more of a slasher horror fan? Haven't seen either though I'm really interested in both. I just take very long to watch horror films. Halloween is my favorite horror film. I love the atmosphere of the movie, and Curtis and the score are fantastic. I've seen some clips of The Cabinet of Dr. Caligari, but I haven't seen the entire film yet. The atmosphere in the movie is wonderful! Definitely check out Caligari if you get the chance. Your dad has good taste!